Myths about famous people have made it ’round the world ever since there was enough communication for myths TO travel. All either blatantly false, or greatly exaggerated. Let’s address these nonsensical beliefs, one by one. William Shakespeare, born in Stratford-Upon-Avon, England, on April 23, 1564, didn’t attend college after he finished his public schooling. Most young men in his day did not. And I have always thought that college is over-rated. I’ve known too many people who graduated from college, but remain clueless about a lot of things. No, young Will married at age 18 (having most likely impregnated a 26-year-old single woman in his hometown); and about five years later, left for London to seek his fortune. Two years later, his occasional visits home to Stratford resulted in the second births in the family — a twin boy and girl. More incentive to find a way to earn a decent living. At some point in the next few years, young Will became an actor with a company that put on plays in and around London. Then, probably because they were short of original plays, Will started trying his hand at writing them. He never claimed that all his plays were totally original compositions. Few playwrights in those days did. Will borrowed plot lines from stories and plays from ear lier in the 16th Century, and elsewhere — even ancient Greece. But it was what he did with them — the uniqueness of the dialogue, the character development, the consistent creation of lines that have stayed with us lo these 400 years — these marked him as a genius. 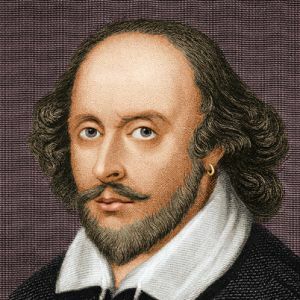 Shakespeare died on his birthday, in 1616, having retired a few years earlier, a nationally-honored playwright and poet, and a prosperous and successful property owner. It took them several years, but in 1623, two of his friends from the theatrical trade, John Heminges and Henry Condell, both of whom were included in his will, published the “First Folio” of all Shakespeare’s extant plays. They were truly his friends; he referred to them in his will as “my fellows,” and left them money to purchase memorial rings. It is believed that a number of the plays would have been lost to the world if they had not been included in the Folio, as they had to be set in type from manuscripts, or “foul papers”, as they were called in those days. They had never actually been printed before. Would they have gone to all that trouble for someone they knew was a fraud? And would they NOT have known that, if it was true? Nowadays, all most people know about German fuehrer Adolf Hitler was that he was “the most evil man in history” (according to the, mostly British, biographers of him) and that his face was fixed in a permanent, fierce scowl. 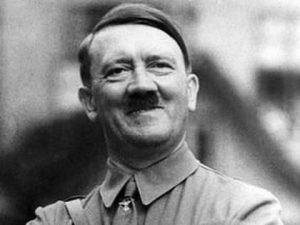 I picked this photo of him to go with this part of the essay because it shows that, yes, Adolf Hitler — “Adi” to his friends in the German army in World War I — could, and did, smile about as often as a lot of people. As to the “most evil man” designation, well, he has a lot of competition for that, including Josef Stalin, Mao Tse-tung, and Genghis Khan. Adolf was a drifting, aimless amateur artist and want-to-be architect w hen World War I started in August 1914. The year before, he had left Vienna, Austria (his native land) and moved to Munich in Bavaria to avoid the draft into the Austro-Hungarian army. Was that because he was “afraid” to serve in the military? No! He despised his native conglomerate of ethnic groups, and the Hapsburg dynasty that ruled it. He did not want to serve in that army. But when the German Empire and a number of other European countries started World War I, Hitler, who greatly admired the empire and the German people, joyously enlisted in the Bavarian army, which made up part of the German army. “Adi” served on the front lines in France for all four years of the war, earning an Iron Cross, first class; an Iron Cross, second class; and another major award. While not “popular” with his fellow soldiers, Hitler was respected for his bravery and for his many narrow escapes from critical or fatal wounds in battle. No one who knew Adolf Hitler personally, ever accused him of being a coward. And in the years to come, when Hitler became the leader of a revolutionary party in Germany, and finally German chancellor, his friends became convinced that he saw himself as a divinely appointed savior who was to lead the German people to “greater glory”. As more years passed, and World War II erupted when the Germans invaded Poland, Hitler was the target of numerous assassination attempts, but he managed to survive all of them. He was convinced that he was being protected from on high so he could save Germany. And he didn’t allow the attempts on his life keep him from visiting his soldiers on the front lines, and taking other chances his generals probably shuddered to see. When, after six years of war, the U.S. forces were bearing down on Berlin from the west, and the Soviet ones from the east, Hitler’s top officials begged him to board a plane they had readied to spirit him out of Germany, rather than risk capture. He refused to consider any such thing. The situation was this: Adolf Hitler was not afraid of death. But he WAS afraid to be a prisoner, to be paraded through the streets of some foreign capital in a cage, to be humiliated and ridiculed. He was not prepared to risk that. So, on April 30, 1945, in their bunker in Berlin, and one day after they were married, Adolf Hitler and his wife Eva Braun committed suicide. They did not “flee to Argentina.” The people who believe in that fairy tale, can’t stand the thought of a Hitler who had bravery in his DNA, who refused to flee from the victorious enemy, who chose to die rather than surrender. Yes, Hitler took his own life. No, he didn’t flee with his tail between his legs, no matter how much the people who hate the very thought of him would like you to believe that. Paul McCartney — “Macca” to his childhood friends — is in my opinion the greatest all-around musician of the 20th Century. Notice I said “is.” Despite the fact that some very gullible people still believe that he was killed in a car crash in 1966, when The Beatles were nearing the peak of their fame. Somehow, these people believe, the other Beatles and Paul’s family managed to keep his death a secret; they searched the British Isles up and down, and, SURPRISE! 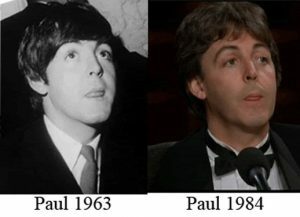 found a young man named William Campbell who was Paul’s exact age, who looked exactly like him, was left-handed like Paul, and could play bass guitar just exactly like he did; whose voice sounded just like Paul’s, and who has since written hundreds of songs in t he exact same way that Paul wrote them. And he’s been pretending to be Paul ever since. And the vast majority of the world is completely unaware of all this. How anyone could actually believe such nonsense leaves me dumbfounded. They even refer to the post-1966 Paul as “Faul.” As in, “Fake Paul,” I presume. I’ve seen a video clip, taken in recent years, showing “Faul,” talking about playing a certain song, and doing the guitar-playing pantomime as he talks. But he’s doing it as if he’s right-handed! It’s startling — until you see the next segment in the video, which is a picture of the very early Beatles, posing in Germany outside a trolley car, with their instruments. There on the side of the trolley, is the name of the company that owns it, in German, of course. But — LOOK! The name is written backwards! Can you say, “negative reversed to try to fool everyone”? I’m sure the Beatles all got a big laugh out of the “Paul is dead” rumor, which was started deliberately as a joke in 1969. They may have even put some hints in the lyrics of some of the last songs they wrote together. But that’s all it was — a joke. Oh, by the way: Paul McCartney DID have a traffic accident in his car in 1966. His injuries? A cut lip and a chipped tooth. Unlikely to have been fatal, I’d say. Macca is alive and well. He’s still touring, singing and writing — at age 75. Rumors of his death were greatly exaggerated. Very interesting, Old Corporal. Good job researching! I think that people began the myth that Shakespeare didn’t write the plays when Shakespeare’s plays began to be regarded as “high brow” entertainment for the intellectual elite. What they forgot was that Shakespeare was a popular playwright. He was the Steven Spielberg of Elizabethan England and his plays were blockbusters. Yes, Shakespeare did put some of the most sublime poetry in the English language in his play as well as penetrating insights into the human condition, but he also made sure to put in smutty jokes and puns for the groundlings. As for Hitler, I don’t think that flight was a realistic option for him. Adolf Eichmann could flee to South America because no one knew about him. Everyone knew what Adolf Hitler looked like and if he had tried to escape Berlin, he would have been caught. Also, Hitler was in very poor health towards the end of the war. Even if he did escape, or won the war, he would not have lived long. I think that from about 1938 on, Hitler was becoming increasingly irrational, with signs of some physical condition impairing his judgement. He seems to have had some idea that he was running out of time, which explains his impatience before and during the war. If Hitler had waited between his pre-war invasions he might not have alarmed Britain and France and gotten everything he wanted without war, If he had waited until Britain was defeated before invading the Soviet Union he might have won. Instead he rushed everything, perhaps because he did not want a successor to get the credit.